Ultra-concentrated! Dilute 1 part concentrate with 48 parts water to create 6 gallons of ready-to-use waterless wash! BLACKFIRE Waterless Wash Concentrate gives you the quick cleaning convenience of a waterless wash in a money-saving concentrate. Once diluted according to the directions, this high lubricity waterless wash loosens light dirt and dust so they wipe away easily. Fingerprints and smudges disappear. Meanwhile, anti-static polymers bond to the paint to reinforce the existing protection and enhance the shine. BLACKFIRE Waterless Wash Concentrate is an incredible value, too. If you washed your vehicle every time a little dust settled on it, you'd be washing it every day! The fact is that our clean vehicles have to face the outdoors and they are going to get dirty, often far sooner than we'd like. To make it easier to keep vehicles clean between washes, manufacturers developed waterless washes. These spray-and-wipe cleaners are quick, convenient, and they do remove dirt... but BLACKFIRE Waterless Wash Concentrate does all that and saves you money. Add 1 ounce of waterless wash to 48 ounces of water. The BLACKFIRE Chemical Resistant Pressure Sprayer is the perfect bottle for waterless washes because it holds 48 ounces of solution, making for easy product measurement. BLACKFIRE Waterless Wash removes dust and dirt PLUS it protects the existing wax or paint sealant. Built-in Wet Diamond polymers - the same found in BLACKFIRE's revolutionary paint sealant - bond to the vehicle to reinvigorate the shine and boost the paint protection. These polymers are anti-static, meaning they do not attract dust or dirt. When you use BLACKFIRE Waterless Wash Concentrate, the results last longer than a couple hours - they can last a few days because less dirt sticks. Added UV protectants in BLACKFIRE Waterless Wash Concentrate keep your paint finish vibrant and rich. 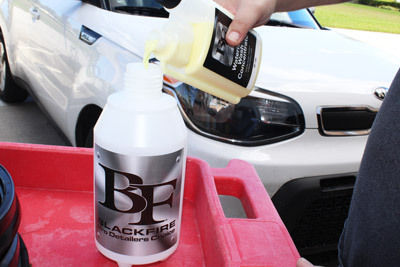 BLACKFIRE Waterless Wash Concentrate works on paint, clear coats, glass, metal, and plastics. It delivers a just-detailed shine without streaking or clouding. For the best results, work out of direct sunlight and use a clean, soft microfiber towel, like the Cobra Super Plush Deluxe 600. Flip the towel often to use a clean side. 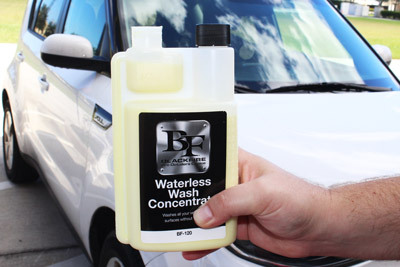 If you want your waterless wash to do more but cost less, you need BLACKFIRE Waterless Wash Concentrate. Work out of direct sunlight for best results. Dilute 1 part concentrate with 48 parts water in a spray bottle. Spray desired surface and use a folded microfiber buffing towel to wipe in one direction. As the towel becomes soiled, flip to a clean side. Continue in this manner until the entire vehicle has been detailed. Change to a fresh towel as needed. I really enjoy using this product as it does a great job of cleaning and preparing the surface for whatever you plan on putting on next. It is super easy to use and mix as the bottle has a pre-mix right on the top of the bottle which is a great feature. I use this product often and it always does a great job. I would recommend it to anyone. To my eyes, the BLACKFIRE Wet Diamond Waterless Wash did an awesome job on my Black, Chevy, Silverado. This improved product is 100 times better than the old. It last longer being concentrate. I will buy more of this product, when I runs out. ProsExcellent, product to use in the winter months and save you much time, when you are on the go. ConsMaybe, the cost, but worth every penny.